Project is better version of this device (polish version only). Almost each element was replaced by SMD components. In this way the circuit is much smaller. 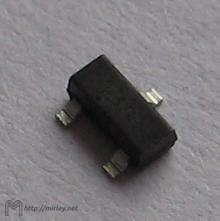 It is possible to use it as small thermometer module or simple thermostat. Slight dimensions allow to use smaller cover (a bit bigger than display). In basic version mini thermometer is able to measure temperatures in two channels. Mini thermometer has two sensors on independent 1-Wire connections. To change between two temperatures, two buttons can be used. In the picture 1 the schematic of mini thermometer is presented. Main part of this project is microcontroller U1 (ATTINY2313). It works with internal oscillator, without internal frequency divider. In result the clock frequency was set to 8MHz. There are no quartz resonator so PCB is smaller and XTAL pin can be used as input port PA0. This input is connected directly to switch S2. Microcontroller has to: read results of temperature measurement from two sensors, calculate values suitable for LED display, read state of buttons S1 and S2. Capacitor C1 (100nF) is placed close to the microcontroller and is responsible for supply voltage filtration. The same task have capacitors C2 (10uF) and C3 (10uF), which are necessary to properly work of voltage regulator U3 (78L05). This project is very simple, because DS18B20 is used as temperature sensor. This sensor is a 12-bits digital thermometer and it can work in area of -55 to 125 Celsius degree. Time needed for temperature conversion is less than 750ms. 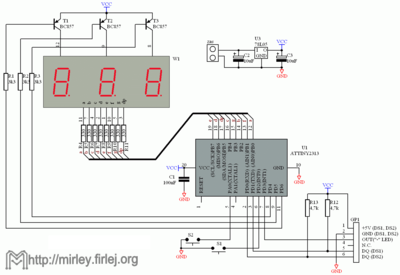 Temperature readout is completely digital, and for the connection with microcontroller the 1-Wire bus is used. For the presentation of temperature is used three-digit LED display with internally-connected segments, adapted for multiplexing. 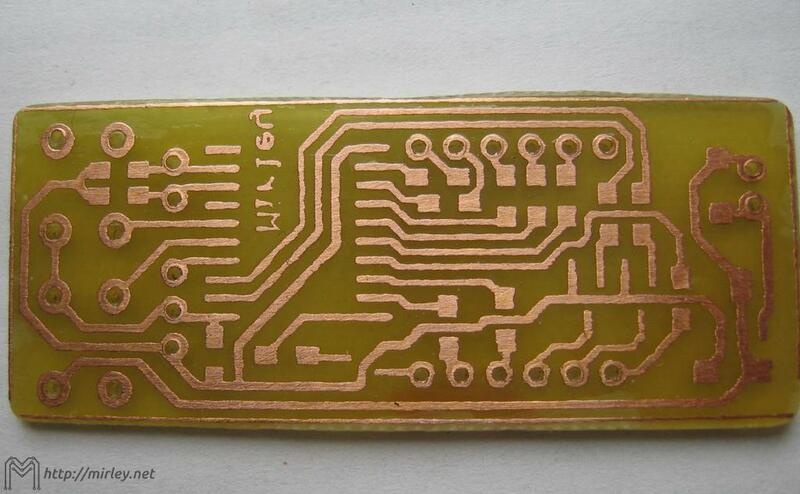 Thanks to that the PCB design is much simpler. 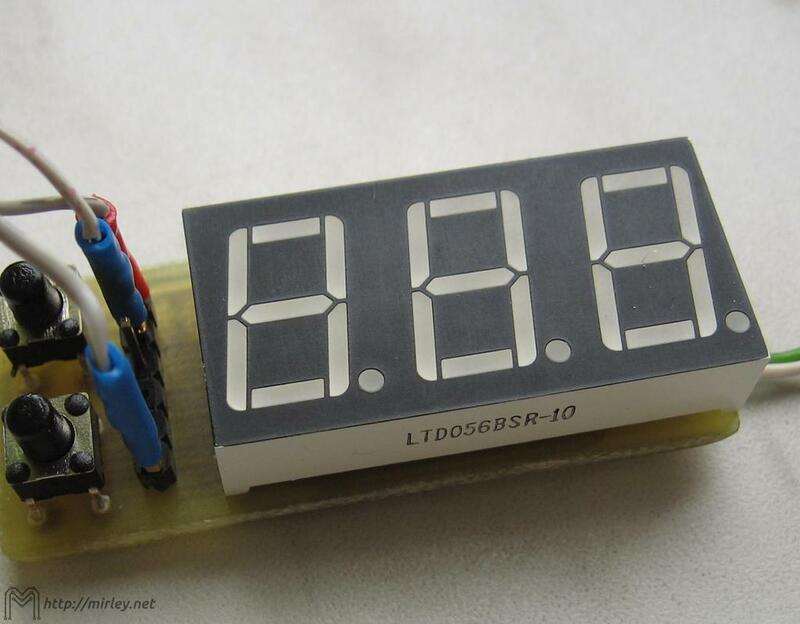 In this case, using separated LED displays makes impossible to make a one-sided printed circuit board. Resistors R4-R11 (330) limits the current of the LED display to a maximum value around 10-12mA (per one segment). The average current will, however, smaller due to multiplexing. 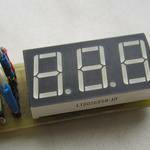 To control the anodes of the LED display, the three popular transistors T1-T3 (BC857) are used. Their currents are limited by the resistors R1-R3 (3k3). Turning on the consecutive digits on the display is done by cyclical setting of a low state on the base of one of the transistors T1-T3. 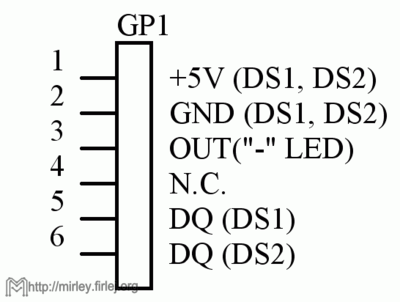 At the same time port B of the microcontroller should be set the value of the encoded digit. An important component is GP1 connector, which is also the place where sensors and control output (in the case of the thermostat) can be connected. 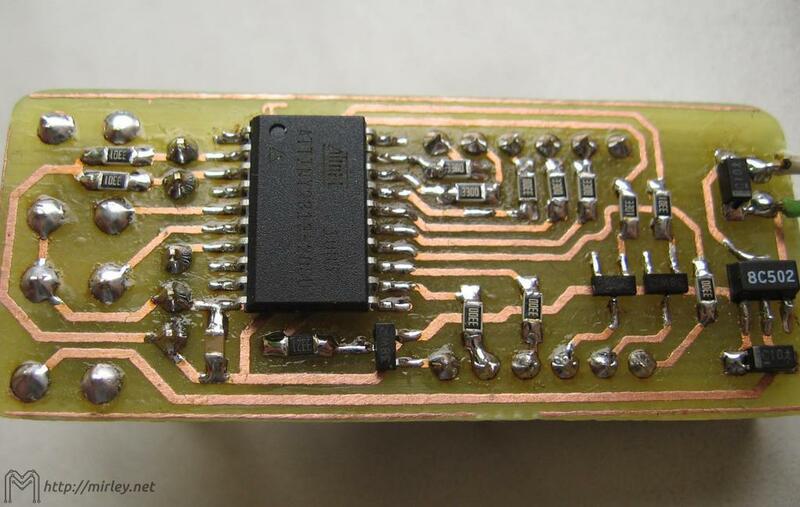 Goldpin connector are not necessary, as can be seen in the photos - wires can by soldered directly to the PCB. In the case of thermometer, control output will go to low state when the temperature is negative. Just attach the LED diode with 470R serial resistor between the control output and + 5V to have the signaling of sign "-". View of printed circuit board from the bottom side may be seen here. Figure in a mirror image is available here. 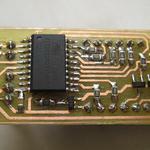 The board is designed as a one-sided, and almost all items are SMD. An exception is the LED display, buttons and connectors. 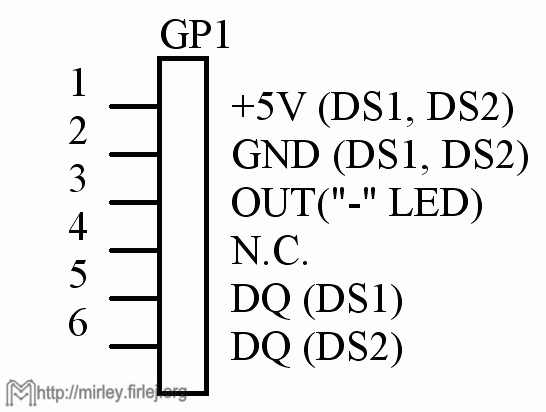 Mounting is not complicated but requires little skill in soldering of SMD components. Figure here will be very useful for soldering the printed circuit board (from bottom side). 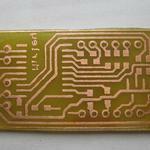 For mounting the top side of PCB very useful will be schematic available here. Pins 1 and 2 of this connector is as follows: the power supply and the ground. Control output (OUT) is available at pin 3. Each of the sensors must be connected by three wires: power, ground and data. The data pin of first sensor should be connected to pin 5, and the second sensor to pin 6 of GP1 connector. The thermometer can be powered with voltages of range 7-12V by the voltage regulator 78L05. Nothing stands in the way to skip the voltage regulator, and connect 5V supply voltage directly to the circuit. The program controlling the operation of the thermometer was written in the well known program BASCOM AVR. It occupies around 70% of the available memory of the microcontroller and can be successfully compiled in the demo version of BASCOM AVR. The program is not complicated, in brief looks like this: all the time processor runs in an infinite loop, waiting for the setting of one of the timing flags (Timer0 interrupt). 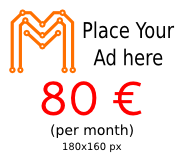 Every 4ms the procedure of LED display multiplexing is called, which in due time a jump to the temperature reading (to avoid display blinking). At the beginning the Timer0 is loaded to value of 131, giving a interrupt after counting of 125 pulses (256-131). 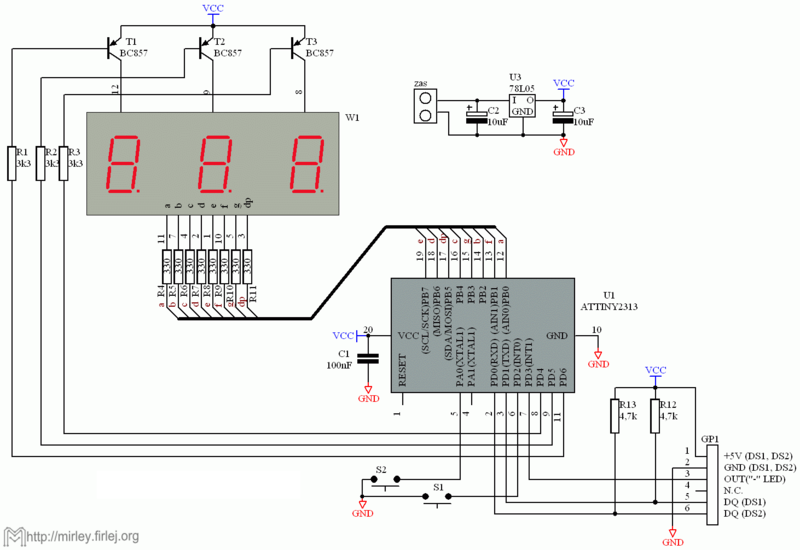 Timer works with hardware divider 256, so clock frequency equal 8MHz gives interrupt every 4ms. Immediately after the interrupt the F4ms flag is set. Variables Dziel(1) and Dziel(2) work as frequency dividers. First of them is responsible for the frequency division by 25 and setting the F100ms flag. The second variable gives extra frequency divider by 10 and sets F1s flag, every 1s. The thermometer operation is very simple and depend only on the flags: F4ms and F100ms. Most of the time the processor spins in an infinite loop, waiting for the setting of one of the flags. Every 4 ms the display procedure and temperature reading procedure are executed, while every 100 ms the buttons states are refreshed. In the basic version of the program a simple keyboard reading was implemented (direct reading of the state of the input pins). Pressing S1 switches thermometer to read the second sensor, and by pressing S2, the circuit passes to reading of the first sensor. Procedure works in 5 steps depending on the state of the Mux variable. It accepts values ​​from 0 to 4, and varies cyclically with the next procedure call. The control output (Portd.3) is set to negated value of the variable minus. It is responsible for displaying negative temperatures and low state on thus port occurs when the measured temperature is negative. Subsequently, through a for loop, the variable Wysw, containing the value to display, is divided into three single digits. They are then converted to LED display codes using the Lookup command (using a conversion table). This procedure gives array W(n) with the coded values​​, where n = 1 ... 3 indexes characters to display. The rest of the procedure depends on the variable Mux. For values 0-2, one of 3 digits are displayed. In this moment the anode, corresponding to previous digit, is switched off, PortB is set to coded value of next digit, and anode corresponding to next digit is switched on. An exception is the digit of W(2) where additional operation (And &B11011111) provides adding a decimal point after the second character. For the Mux = 3 the temperature measurement procedure is called, and the state Mux = 4 is the phase of waiting for the temperature measurement. This procedure is called every 20ms, but the temperature measurements takes place every 1s, after detection high state of the F1s flag. It is simple version of 1-Wire bus, configured to communicating with one device. All 1-Wire commands are called with the parameter Kanal, which is responsible for select the proper bus to read temperature (or pind.1 pind.0). After a reset, the skip ROM command and read DS18B20 registers command are sent. Then the two bytes are read and stored in variable T (integer). The temperature sign is read and performs a simple calculations. As a result, the variable T takes the form of temperature in degrees multiplied by 10 (eg. 13 means 1.3 degree). At the end of the procedure the temperature conversion command is sent, which provides always actual temperature value in DS18B20 registers.